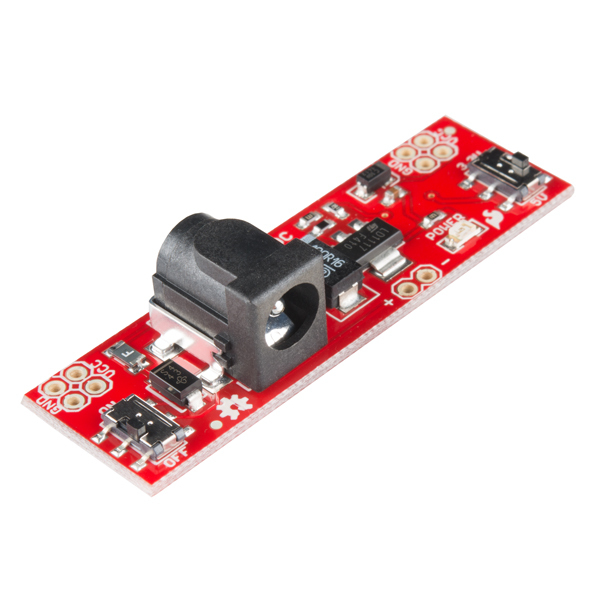 SparkFun's GitHub Repository for the Fritzing parts does not include the Breadboard Power Supply Stick. However, it is already included in the included in the Fritzing library. You just need to search for the term " Breadboard Power Supply Board SMD " and it should be the first part that shows up. You might need to make sure that you have the latest Fritizing software version and part library downloaded from Fritzing [ http://fritzing.org/download/ ]. I have the earlier version -- you should consider a version that has independently selectable voltages: so you can have, e.g., 3V3 on one side and 5V on the other. Can this provide power to charge a li-ion battery? This is cool but I'd really like to see it with simultaneous dual voltage output. I often have breadboard projects where I have a 3.3v and a 5v rail at the same time. 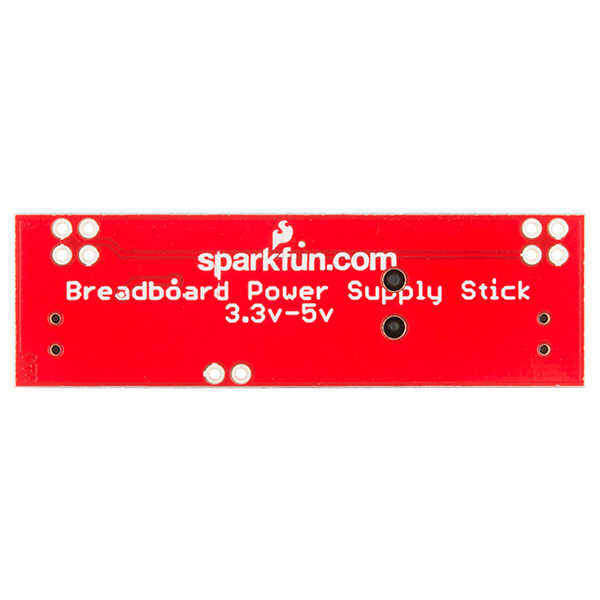 Much the same as the breadboard power supply kit ( https://www.sparkfun.com/products/114 ), yes? Having a few of these lying around makes it easy to quickly try something or leave something with a supply handy. This wonderful little board let's me choose 3.3V for a Particle board or 5V for an arduino and the extra header let's me pull off the source 12V. I have only recently begun working on electronics projects. This power supply works well for my needs. I mostly need 5 volts, for my breadboard for small projects. I soldered four header pins into the board and that was that. I pushed into the breadboard easily. There is an on-off switch and a switch to go from 3 volts to 5 volts. Works great. Very happy with it for the price. This is a great board, add on for using a breadboard. Especially when needing 5 or 3.3 volts. Easy to solder the pins. The only complaint that I might have is that the on/off switch is small. Great board. I love it. This is a great little power supply. I'm using it regularly. 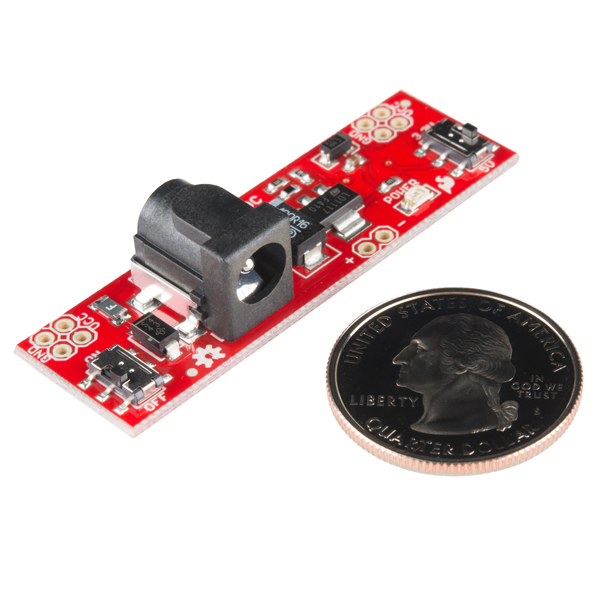 The surface-mounted ON/OFF and voltage switches are convenient as is the generous supply of PCB holes for .1" pins. My only complaint would be about the lack of mounting holes. From the name, I assume that the board is meant to be plugged into a solderless breadboard. But unless I missed something, the two sets of four GND and Vcc holes at either end of the power supply are not exactly on the standard 0.1" breadboard spacing. So if .1" male connectors are mounted at either end of the power supply, it won't quite fit into a breadboard. The description says the headers are all 0.1" which is true. However, the individual headers are not on a 0.1" grid relative to the rest of the board so mounting the power stick on a breadboard like PRT-13268 isn't really possible. Maybe the PRT-00112 type would be forgiving enough but I wanted to hard mount the stick into a prototype and that was not happening. This is a very useful product to more easily get power to your breadboards from a variety of power bricks. I like the fact that you can easily switch between different voltages, and you have a nice convenient power switch on the board. One suggestion I would have that would make this product even more useful would be to somehow add a way to have a passthrough of the power supply's original voltage to the board. 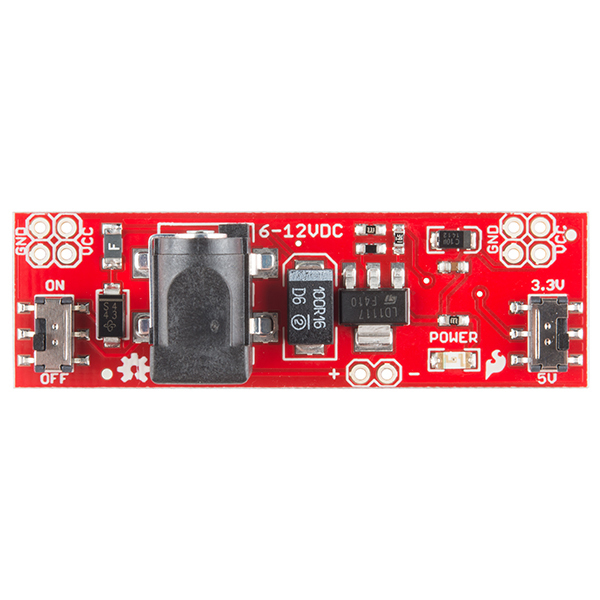 I have a 12V, 2.0A power supply that I would like to have power an LED light strip, but use this board to deliver the stepped down Voltage for a microcontroller. I know I could use a simple Voltage regulator to manage this myself, but having a switched passthrough of the unregulated power supply for other uses would be very convenient. As an aside, I did notice that I could kinda get what I wanted by wiring the "+" and "-" connections which were intended as a supply input out to my board. I get an unregulated connection to my raw power supply, but it isn't tied to the "On/Off" switch. Otherwise, thanks for this useful product!